As the costs associated with the construction of pipeline facilities continue to rise, new methods of construction are being developed and alternative materials are being discovered and/or manufactured to offset these rising costs. 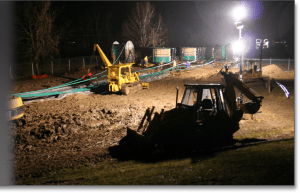 While Mid-Ohio Pipeline is proficient and experienced in the traditional installation of steel for high pressure transmission lines, we have also been actively involved with the use of alternative materials for high pressure pipeline construction for nearly 10 years. These alternative materials are capable of withstanding pressures historically seen in transmission related facilities while accommodating improvements in efficiency and/or reduction in cost. We have targeted projects utilizing these technologies for nearly a decade and have installed over 350 miles of pipeline using these alternative materials. In performing work for various gas companies in several states, we currently have crews experienced and certified in performing alternative material transmission pipeline construction services designed to transport gas, oil and brine water. Each of our transmission crews have the necessary training and carry the manufacturer’s certifications to install these transmission pipelines using alternative materials. Mid-Ohio Pipeline will continue to pursue opportunities that lead the pipeline construction industry. We will continue to evolve to meet the current demands of our customers and the industry in which we serve.